I have a confession to make. I wear glasses. Shocking, I know. However, the real confession is that even though I wear glasses, I don't ever really think about eye health. I mean, I know about glaucoma, cataracts, and how diabetes can be disastrous for your eyes. I just never really give a thought to general eye health. I never question just how healthy glasses/contacts really are. I never really think anything of it when my prescription glasses have to strengthen. I just go to my annual checkup, wear my glasses, and occasionally remember to turn on the blue light filters on my devices. Recently, I came across a great article while browsing Wellness Mama's blog. It went into great detail on how she began improving the eyesight of her daughter using natural methods. I had never thought to even ask if you could use more natural methods. This sparked a frenzy of research and a decision to inform myself, and you, about natural eye health. Like so many things in life, your eyesight can be greatly improved by what you eat. Your diet can also play a big part in preventing future eye conditions. One of the most notorious nutrients for eye health is vitamin A. There are actually 2 different forms that this vitamin can be found in. First there is retinol. Retinol is vitamin A that is derived from animal products. This version can be used directly by our bodies and is found abundantly in whole milk dairy, and beef or chicken liver. Provitamin A carotenoids are found in fruit and vegetables (carrots, tomatoes, sweet potatoes, kale, spinach, and cantelope). These are converted to retinol in our bodies. The most infamous one of these is Beta-Carotene. Vitamin A helps to protect the surface of our eyes, preventing infections and helping to prevent vision loss due to macular degeneration (AMD). Vitamin A also helps improve night vision. Vitamins C and E, as well as Lutein are also great for your eyes and can help prevent age related vision loss (from AMD), slow down the formation of cataracts, and help keep your eyes healthy over all. You should all know by now that I have a love for herbs and all the amazing things they can do for us. Like in every other situation in life, there are several herbs that you can turn to for help with your eyes. Eyebright, Euphrisia officinalis, has a reputation for being great for your eyes. A reputation that has been well, and truly, earned throughout the years. In the 14th century, it was a cure-all for the eyes. It is used to reduce inflammation of the eye caused by irritation or infection. 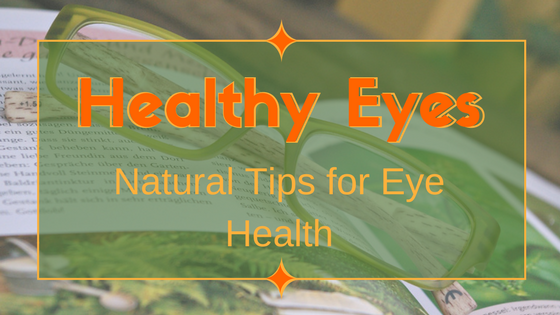 Other beneficial herbs for the eyes include garlic and turmeric (help prevent cataracts), bilberry and black current (help improve night vision and reduce visual fatigue), ginko (improves blood circulation to the retna), and coleus (reduces the production of fluid in the eye). One of the most important things you can do for your eyes is to utilize proper eye protection. I'm talking sunglasses, blue light filters, etc. UV damage can severely increase the risk of developing major eye issues later in life, as well as cause a loss of vision in the shorter term. Keeping your blood pressure and blood sugar under control are also great ideas to keep your eyes healthy. Both can severely effect your vision and eye health. The absolute most important tip for eye health, however, is to visit your eye doctor regularly. Many problems with your eyes start with little to no symptoms. Your eye doctor, however, will test for these and knows what to look for to get an early diagnosis. I hope this has encouraged you (and me) to think more about your eyes. Please seek out other tips and feel free to share. Do you have any questions or comments? Post them below! Thank you! I'm glad you think these tips are easy and helpful! Great eye health begins with the food on our plate and I think the plant world offers a mixture of anticipation and treatment for healthy eyes. visit instant assignment help reviews and Follow these basic strides for keeping up solid eyes very much into your brilliant years. I agree. So much of our health begins with the food we consume, not just eye health, but whole body health. I am glad you enjoyed my post, but the article you linked sent me to a "snacks for weight loss" article. I think you might have linked the wrong one. Thank you.